1. What falls from pockets? There is something unnervingly seductive about the films of Sarah Miles. Her films are content rich. Their fragmentary images and sounds delineate a provocative body of work, the core of which is the notion of memory, particularly the personal and familial. Miles belongs to a tradition of the auteur, singular in vision and considered in methodology. Her films can be situated within the realm of the essay form, one in which the 'I' of the author has an insistent presence. Miles' films are embedded with a sense of the filmmaker's own journey, in which she is part performer and part instigator. Yet while her films are personal, a critical distance prevails. Objectivity is acted out through a montage of images, which are sourced from found visual/audio footage, interview recordings and constructed scenes. When these elements are brought together with either nuanced or explicit references to cinema and other cultural markers they enable the viewer to navigate through the personal material via a performative act of translation. Juxtaposing autobiographical material alongside material gleaned from collective memory, her films shift between participant and observer, the events and the re-telling, the real and imaginary. This liminal place is often described as dreamlike, yet in Miles' work one feels very much awake and aware. The richness of her imagery and mise en scene, opens the work out to layers of potential readings, inviting closer inspection and engagement. The manner by which Miles' films excavate past narratives, stories and events, leads to an exploration of the implicit nature of collective memory; the backbone to several of her films, specifically A Bunny Girls Tale, Damsel Jam and 2001: A Family Odyssey. Ophelia's Version. There is constant slippage between those memories and events that can be celebrated and articulated and those which remain difficult to speak about; so that the traumatic, for example, remains on the periphery as suggestion. 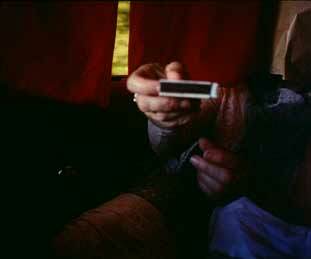 The external elements of soundtrack and found footage in Miles' films perform an important role as they hint at the traumatic without being direct and confrontational. For example in A Bunny Girls Tale, there is explicit reference to news reports and documentary footage of the Bunny Girls; Damsel Jam references Alice in Wonderland and makes clever use of Nirvana's song Smells like teen spirit, whilst No Place recreates scenes from Vertigo and The Wizard of Oz. These intertextual elements work as disjunctive tools to explore remembering and navigating memory, enabling the traumatic memory and it's re-surfacing to be translated, mediated and alluded to rather than made explicit, and paralleling the complex and difficult nature of the 'subject in the act of remembering', in which truths and realities fuse and flux. Yet, this theoretically informed work has a suggestion of 'flirtatiousness', not in a superficial flippant way, but in a nefarious manner. There is an innate sense of something uncontrollable yet bounded, something on the edge, something on the brink. A good flirt, a successful flirt, knows how to swim between the slippages of meanings. Never making anything too explicit, too obvious. Importantly, there is something a little pleasurably traumatic about flirting: we are left questioning our own boundaries, but at the same time desiring more, but what we are uncertain.